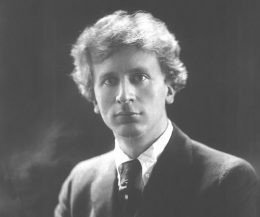 Percy Grainger was a polymath: a pianist, composer, conductor, ethnomusicologist, inventor, artist, polyglot, and man of letters. He was one of the most celebrated pianist-composers of the early twentieth century. His work and writings reflect a worldview marked by both racial consciousness and an opposition to modernity that coexisted alongside radical artistic modernism. Born in Australia, Grainger was a prodigy in his youth. He was raised under the strict discipline of his mother, who educated him at home. After making his debut at the age of 12 to great acclaim, he was sent to the Hoch Conservatory in Frankfurt. He enjoyed a successful career as a pianist and went on tours throughout Europe. I developed my mature harmonic style—that is to say, harmony in unresolved discords . . . such a procedure was unknown at that time  and must be considered an Australian contribution to musical progress. So through that parcel of books my father sent me, I became what I have remained ever since, a composer whose musical output was based on patriotism and racial consciousness. Grainger’s youthful compositions bear the stamp of his characteristic idiosyncratic style. As a student, he rebelled against his conservatory training. He was a member of the Frankfurt Group, a group of mostly British composition students who rejected the central European tradition. Many of his works make use of modal harmonies and whole-tone scales, “double-chording” (a term he coined to describe chordal passages that when played together create harmonic dissonance), irregular rhythms and rhythmic divisions, microtonality, and unconventional orchestration (including the use of such instruments as mandolins, theremins, and solovoxes). Later in life he composed music onto player-piano rolls (long before Conlon Nancarrow), anticipated prepared piano music (In a Nutshell) and aleatoric music (Random Round), invented machines prefiguring modern electronic instruments, and experimented with techniques like multitracking, sequencing, etc. His name is most often associated with the frothy folk ditty “Country Gardens” (which he came to despise, just as Rachmaninoff hated his C sharp minor prelude), but his output is far more varied and experimental than one might surmise from this work alone. Grainger aspired to create “free music”: music that was free from scales, fixed intervals, rhythmic constraints, and other conventions. The idea of “free music” occurred to him when he was a young boy as he observed the movement and sound of waves lapping against the side of a boat. He saw “free music” as a vehicle through which to capture the sounds of nature. He was an early promoter of electronic music, which he believed could realize this ideal. In his later life, he attempted to create music machines toward this end with the collaboration of the physicist Burnett Cross. Among these were the “Butterfly Piano,” a piano with each note tuned one-sixth of a tone apart; the “Oscillator-Playing Tone-Tool,” a contraption that used a sewing machine to manipulate the pitch of an oscillator; and the “Kangaroo Pouch Free Music Machine,” a more complex machine that utilized then-recent transistor technology (the name refers to the pockets formed by paper contours attached to the paper roll wound between turrets housed within the machine). These inventions influenced the evolution of modern electronic music. Grainger saw the idea of “free music” as his greatest legacy, but he is best known for his role in the English folk revival during the early twentieth century (except in America, where he is better known for his music for concert band). He became interested in folk music while living in London, where he lived for around a dozen years from the age of 20 before moving to the United States. Grainger composed hundreds of arrangements of folk songs over the course of his life. He pioneered the use of the phonograph to collect folk songs and gathered more than 200 Edison cylinder recordings while hiking through the English countryside. Many of Grainger’s folk song arrangements have a wayward, almost zany quality to them (e.g., “Lincolnshire Posy”) that combine the nostalgic familiarity of folk music with the eccentricity of his own style. A number of his original works also include themes reminiscent of folk song that are given an idiosyncratic twist. His Hill-Song no. 1, which he considered one of his finest compositions, contains pastoral-sounding melodies that unfold with convoluted, meandering rhythms and unusual harmonies, and the third movement (“Pastoral”) of his In a Nutshell suite has a dreamy, darkly bucolic quality and undergoes sublime harmonic shifts. One of Grainger’s greatest influences was Edvard Grieg, Norway’s leading composer during the nineteenth century. Grieg was influenced by contemporary Norwegian romantic nationalism and some of his works incorporate Norwegian folk music: it was his Norwegian Folksongs that first ignited Grainger’s passion for Grieg when he was 17. Grainger admired Grieg’s harmonic innovation and the “twists and contrasts and elvish sparkle of his music.” He frequently programmed Grieg’s works, including his concerto, the Slåtter, Norwegian Folksongs, and Ballade. Grieg likewise thought highly of Grainger’s music and sent him a letter along with an autographed picture. The two met in London in 1906 (Grainger was 24, Grieg 63). They formed a close bond and corresponded frequently. Grainger became fluent in Norwegian. In 1907 Grainger visited Troldhaugen, Grieg’s home in Norway, where they rehearsed Grieg’s piano concerto. Grieg died that year but remained one of Grainger’s main influences. Grieg’s piano concerto became the piece for which Grainger was most known as a pianist. He became the foremost exponent of Grieg’s music and for this was awarded the St. Olav Medal in 1954. From 1922 to 1927, Grainger embarked on four expeditions to Jutland in order to collect folk songs from the region. He was joined by the Danish folklorist Evald Tang Kristensen. The two recorded and notated more than 170 Jutish folk songs. The result of this project was Grainger’s Danish Folksongs Suite. In Jutland, Grainger also encountered figures such as Jean Sibelius, Henrik Ibsen, Knut Hamsun, Carl Nielsen, Johannes V. Jensen, and others. Over the course of his life, Grainger became fluent in several Nordic languages: Danish, Swedish, Norwegian (both what was then Riksmål and Landsmål), old Icelandic, and Faroese, as well as a number of dialects. He also spoke German and Russian and had some knowledge of Romance languages. Grainger’s obsession with Nordic culture and heritage also led him to construct his own form of English in a quixotic attempt to revert the English language to its Anglo-Saxon origins and purge it of words with Latinate roots. He called this “blue-eyed English.” His prose is peppered with neologisms like “blend-band” (“orchestra”), “mind-tilth” (“education”), “tone-art” (“music”), “over-soul” (“genius”), etc., reminiscent of the kennings one finds in Old English verse. Indeed Beowulf was one of his main literary inspirations. If we Nordics can work out a plan of life in which behestpowerfulness ((authoritiveness)), sale-gain ((profit)), slavedriving, brutalness (such as the slaughtering of tame beasts for food, of men in war) & unkindness are outlawed–a plan of life in which sheer goodness, sheer beauty, sheer workwillingness are worshipped for what they are (& not for the sale-gains or power-sway they may roundaboutly or haphazardly bring with them)–we shall not have any more trouble with Jews, or with whatever lower types there may be within our own races. Grainger believed that the worship of “sale-gain” impeded ethnic and racial self-determination and also was inimical to the cultivation of beauty and art. Thus he criticized modern urban life, which he saw as characterized by ugliness and economic greed, and extolled the simplicity of country life. He also condemned cruelty toward animals, which he associated with Jews, and defended animal rights. He was a vegetarian for much of his life. Grainger identified most strongly with Nordics but was interested in the music of other cultures as well. The influence of non-Western music appears throughout his works. He became fascinated with Indonesian music upon hearing a Balinese gamelan percussion orchestra at the Paris World Exhibition in 1900 (much like Debussy, whose Pagodes Grainger transcribed for large percussion ensemble). He later studied the collection of Javanese instruments at Leiden University’s Ethnological Museum and transcribed Javanese and Balinese music from Erich Moritz von Hornbostel’s collection Music of the Orient. He also admired Māori music and Rarotongan polyphonic singing. Personally I do not feel like a modern person at all . . . I do not dislike modern people, but simply cannot learn to understand their reason for being, can never get a true insight into their ways of feeling & acting, & feel among them as among kind but very strange strangers with whom I will take a mighty long time to get acclimatised. I do not tell you this in order to appear “funny”, but in order to throw light on the well-springs of my music. Art with me arises out of the longing to escape out of the (to me) meaningless present into the past, which to me is full of meaning, or into some imaginary world full of keenness & exaggerated excitement. I would like my music to breathe something I see in Grettir & in the Maori proverb “Die like the shark, fighting to the last gasp” . . . Some force like that, a force not of beliefs, morals, ideals & ideas but the bodily force of life itself, is what I always long to invest my music with. I wish to leave the uplifting ennobling work to others, but wish in my art to try & voice the unbeatable freshness & undowned ever-trying ever-daring life instinct of men & beasts, the stubbornness of the spider, the tough endurance of Grettir . . . .
Grainger’s fascination with pre-modern societies and his commitment to preserving folk music prove that his aesthetic modernism did not entail a mindless rejection of the past. Rather he sought to revitalize the past and give it new meaning and new forms. This firmly places him among the ranks of “anti-modern modernists” such as Ezra Pound, Wyndham Lewis, Knut Hamsun, and others who have striven to infuse the remnants of Western civilization with new life. Malcolm Gillies, David Pear, and Mark Carroll, eds., Self-Portrait of Percy Grainger (New York: Oxford University Press, 2006), 17. Brent Wells, “Percy Grainger and the Phonograph: The New Science of Folk-Song Collecting,” Choral Journal, vol. 52, no. 2 (September 2011): 37. Robert Simon, Percy Grainger: The Pictorial Biography (Albany: Whitston Publishing Company, 1983), 5. Percy Grainger, “Characteristics of Nordic Music.” Notes for broadcast over WEVD, New York, July 1933. Transcript. Percy Grainger to Heinrich Simon, Sept. 11, 1936. Elinor Wrobel, The Nordic Inspiration: Percy Grainger (1882-1961) and Edvard Grieg (1843-1907), exhibition catalogue, Grainger Museum, 1993, 4. Percy Grainger, “Personal Recollections of Grieg,” Musical Times, November 1, 1907, 48. Bob van der Linden, Music and Empire in Britain and India: Identity, Internationalism, and Cross-Cultural Communication (New York: Palgrave MacMillan, 2013), 71. Elinor Wrobel, Percy Grainger: The Noble Savage, exhibition catalogue, Grainger Museum, 1992, 10. Percy Grainger to Douglas Charles Parker, August 23, 1916.